If you are Russian you can’t say the name Marfa out loud and not giggle. 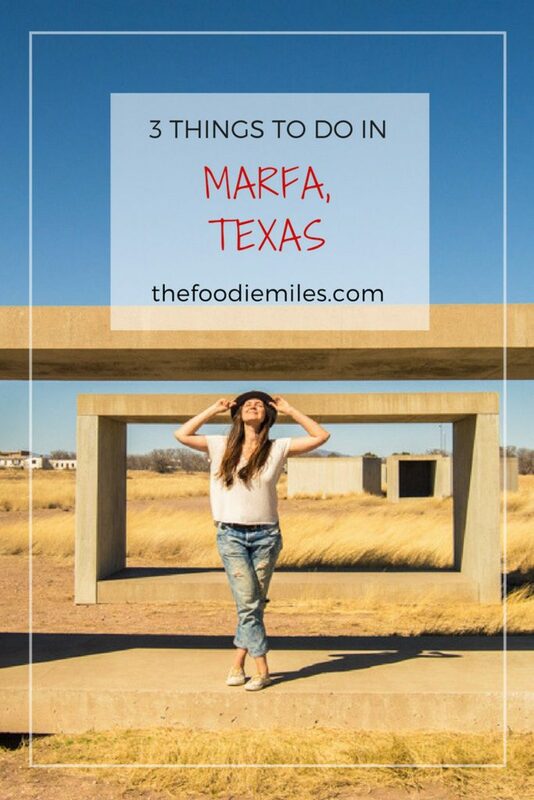 Marfa is an old-school Russian name that was popular years ago, but nowadays is only used to describe a country bumpkin or a person who’s done something stupid. The Russian name was reason number one to visit. Reason number two was the famous Prada shop located within 30 min drive from the city, in the middle of desert. Reason number three – the picture of Beyoncé strutting down the streets of Marfa with a plate from a local food truck in hand. All the right reasons to choose a destination. Whether Beyoncé was right and this small Texas town was worth seven hours in the car would become clear before we arrived. We drove in silence. First, cell phone reception disappeared. Then, radio gave up producing anything but noise. Even conversations ceased as we looked ahead at endless dessert and mountains. What you have to understand is that I am not as shallow as to travel to a small Texas town just because Beyoncé visited it. 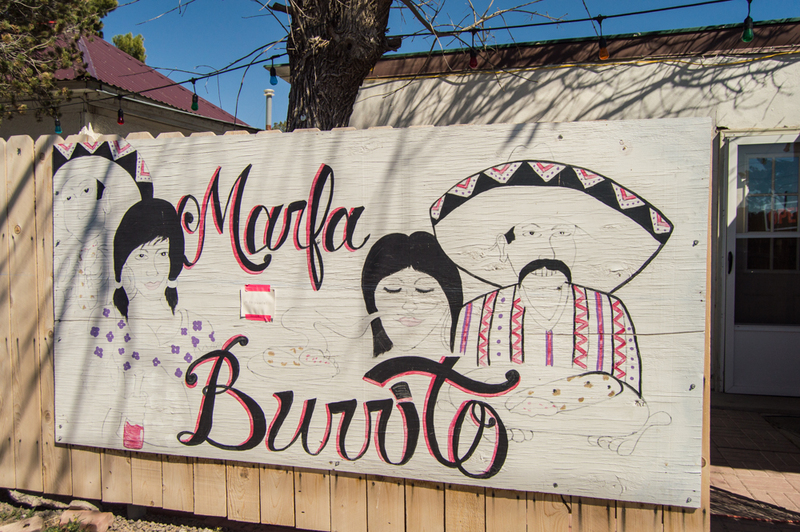 If you must know, Matthew McConaughey has been there too and loved Marfa Burrito. 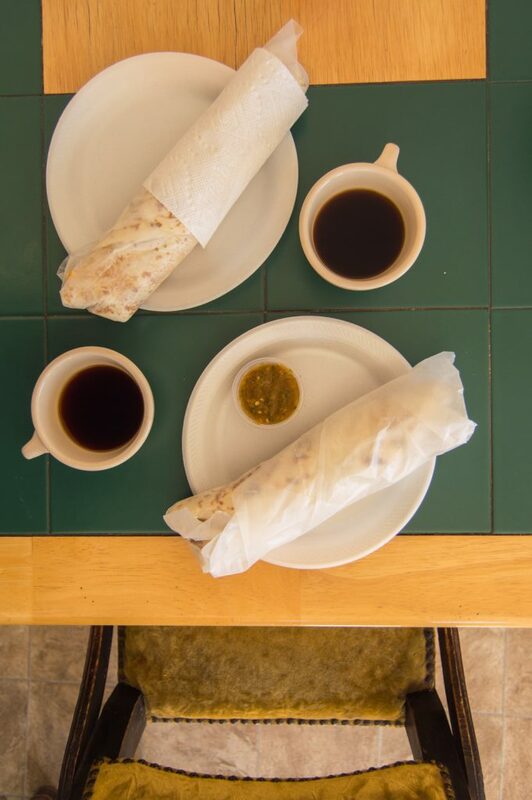 So where else do we make the first stop but a small joint selling burritos filled to the brim with beans and potato for $5! Five bucks here, ladies and gentlemen, will provide you with a meal so delicious and satisfying “you will think they kidnapped your mama”. Not that my mama, being a Russian woman, has ever made burritos. But you get the point. 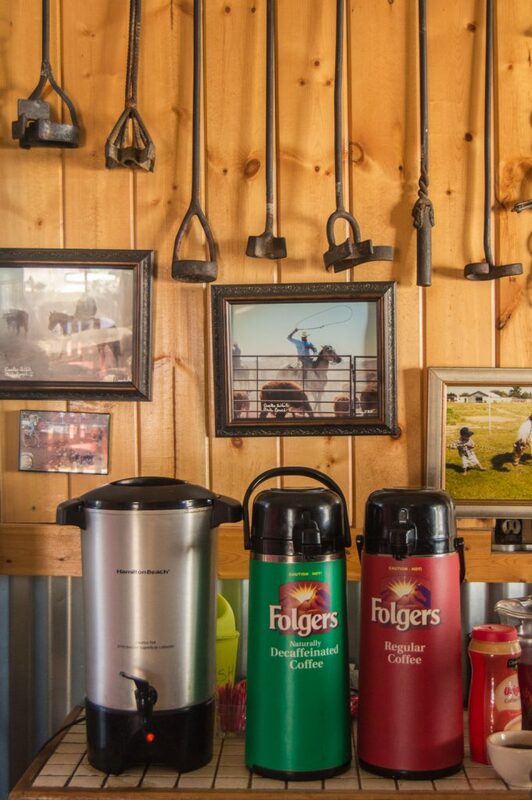 The picture of Matthew McConaughey hugging the owner and cook, Ramona, is framed and proudly hung on the wall. The picture of Mark Ruffalo hugging Ramona, although also on the wall, is not framed. I don’t know whether we should draw conclusions here… I also spot a photo of someone who looks like a country singer. Desperate to take a picture of the memorabilia wall I am silently praying that the guy sitting right in front of it finally moves, until I realize the guy sitting in front of the wall is that same country singer from the photo. Now I am in a pickle, aren’t I? Can’t ask a celebrity to move so I can take a picture of the picture of another celebrity. I finally get in the line and order my egg and cheese burrito from a window cut into a door. The door separates small dining room from the kitchen where a Hispanic woman is rolling the dough for fresh tortillas. On top of $5 burrito I get a free cup of coffee – probably, the best deal I have ever gotten. Burrito comes out of the kitchen so hot, I can see steam raising after the first bite. What it tasted like I can’t remember, but I remember the feeling of being home, being in just the right place. I didn’t dream of my home in Russia, but rather an idea of home, a place where I am welcome, comfortable and cozy. After all, this is why food is so crucial to our memories. It’s not what it tasted like that matters, it’s what it made you feel like. What you expect to find in a small Texan town is ranches and long horns. 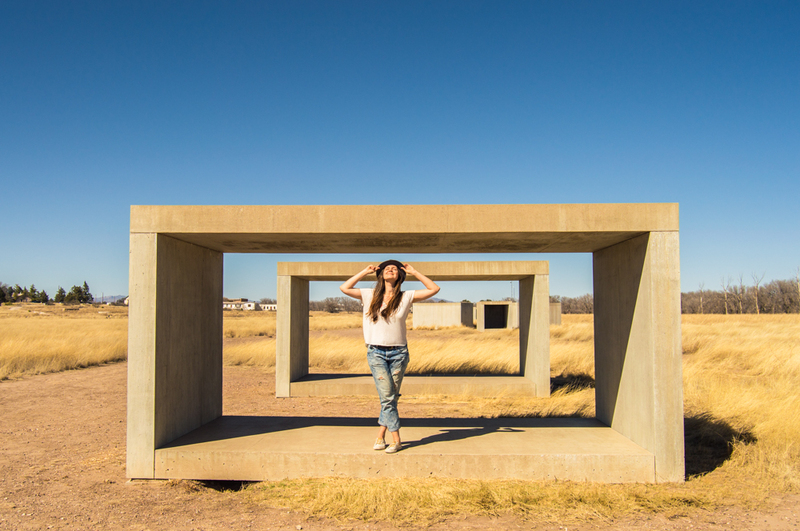 What you find in Marfa instead is tons of art installations. I wrote “tons” and immediately realized it works on all levels: figuratively and literally. Giant concrete blocks run along the border of Chinati Foundation property in what looks like random pattern, but I am sure has meaningful explanation. That happens a lot with me and modern art: I find it fascinating, but utterly complicated and impossible to interpret without help. 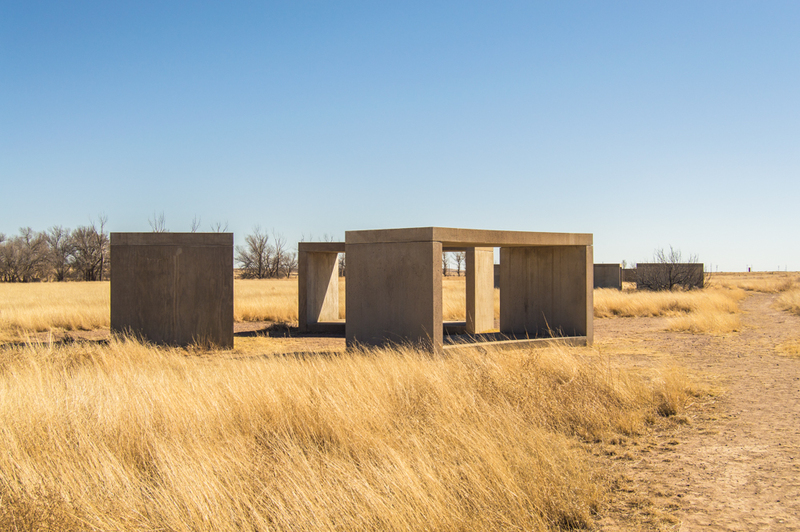 Minimalist artist Donald Judd who, as unbelievable as it sounds, escaped to Marfa from the hustle and bustle of New York at the peak of his career, singlehandedly put a small town in West Texas on the map. It’s his minimalist works that turned Marfa into a mecca for art aficionados from all over the world. Upon moving here in 1970-s, Judd acquired an Army base and started filling it with art works, both his own and created by the artists he loved. 15 untitled works in concrete were the first objects installed at the museum. To see them up close I courageously walked through tall yellow grass with no pathway in sight. I ended up with scratched ankles and hay in the most unexpected places, but who said that witnessing art is an easy thing? I found the tiny pathway later, on the way to another installation located in two former artillery sheds – 100 untitled works in mill aluminum. 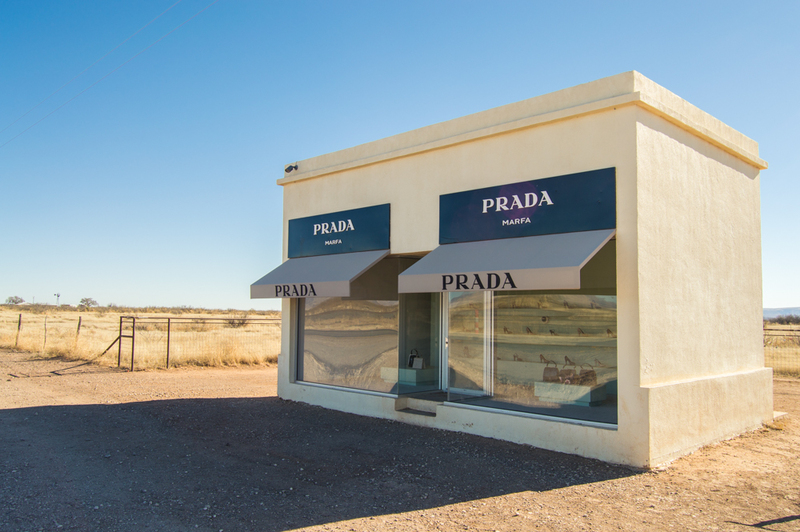 As if art connoisseurs weren’t enough for the little town in West Texas, Marfa is flooded by thousands of fashionistas traveling here with one goal – to take a picture in front of Prada store. The shop is located right in the middle of Texan dessert with nothing around but occasional cars passing and tumbleweeds rolling on the road. Although the doors of the store are always closed, you can peek through the window and see real Prada shoes and bags from the fall/winter 2005 collection, selected by Miuccia Prada herself for the art-project. Marfa is located somewhere on the crossroads of strange and amazing. 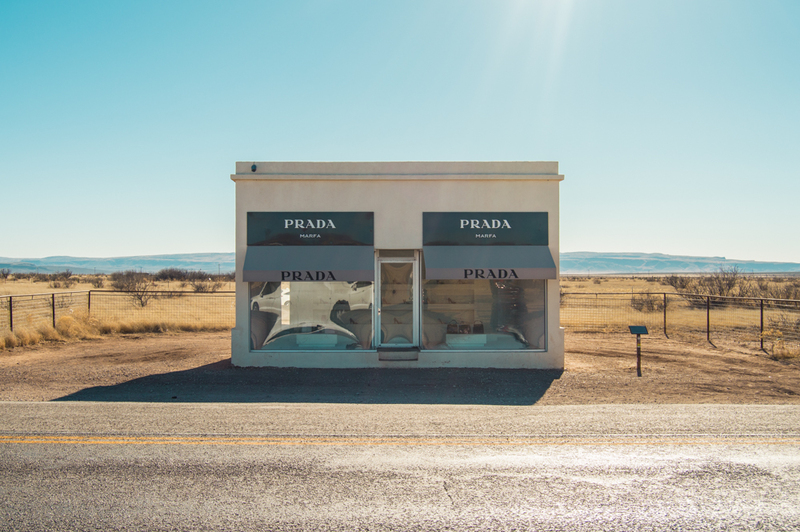 Beyoncé might be the reason why you find out about this tiny town, but it’s Marfa’s unmistakable creative spirit that you will truly remember. It might be the hype that will bring you here, but it’s Marfa’s uniquness and strangeness that will make you return. P.S. 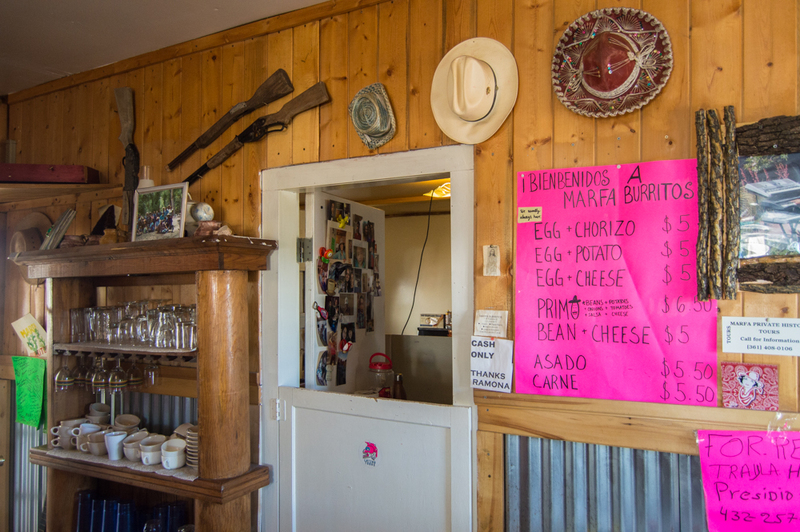 If you are visiting Marfa, TX, you might want to stop by Terlingua that is located nearby or have breakfast with cowboys in Alpine. 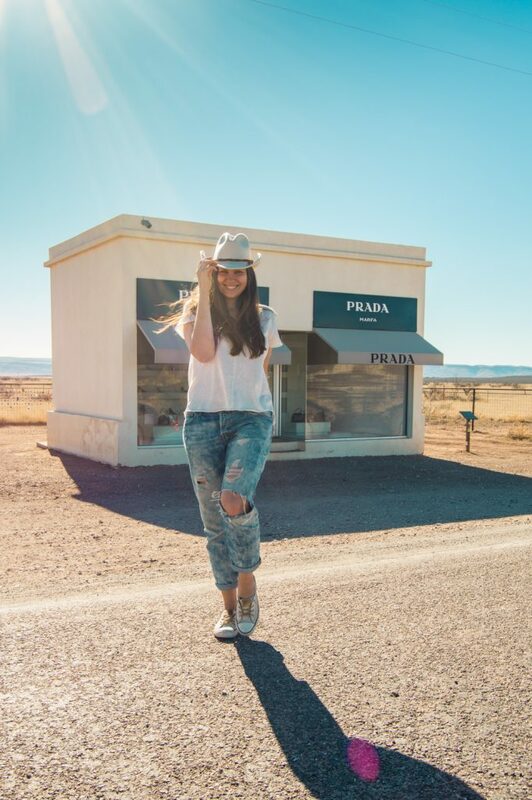 Have you been to Marfa? 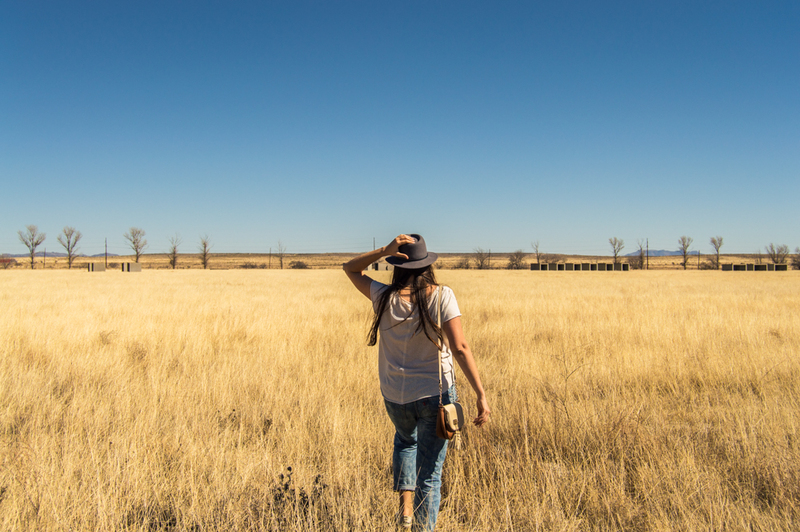 What are the other things to do in Marfa you’d recommend? The photos of you in front of the Prada store are very cute! Well, I didn’t learn about this town from Beyonce… I learned about it from you! I’m feeling like a failure of a Texan for never knowing such an odd place existed, but I’ll have to add it to the Texas bucket list. You are so sweet Kate! I am happy I could help! But really that’s what always happens with the city/state where you are from. You have to deliberately look for something fascinating. I haven’t seen as much in Russia in my whole life as I have in USA in the past few years. So I know the feeling!